About 1,000 die in seven days, with 2,510 lost in 2016, as the crisis worsens. 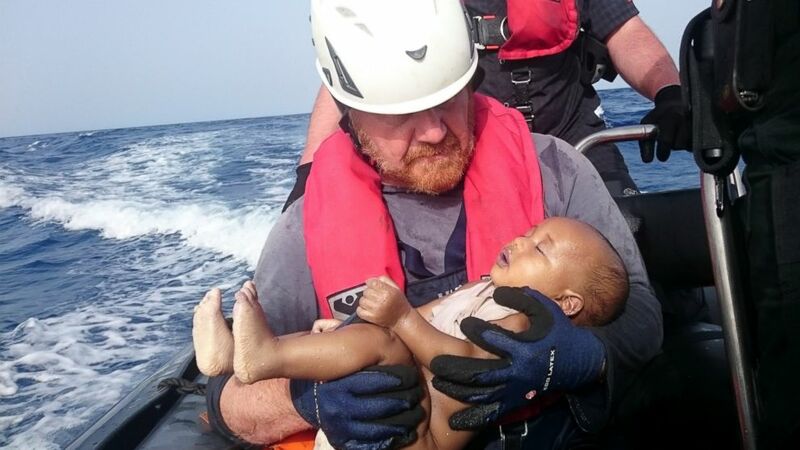 The image of a drowned infant being held in a paternal embrace by a German rescuer has quickly become emblematic of a harrowing seven days in the Mediterranean Sea, one in which over 1,000 people are presumed to have died in shipwrecks and capsizings, according to the International Organization for Migration. The dead child, whose name and gender have not been disclosed, was pulled from the sea Friday after a wooden boat capsized filled with people attempting to find safe haven in Europe. The infant appears to be only a few months old. The baby's tiny hands are clenched, eyes closed and lips slightly apart in a tiny pout. (Reuters) German rescuer from the humanitarian organization Sea-Watch holds a drowned migrant baby, off the Libyan coast on May 27, 2016. The baby, who appears to be no more than a year old, was pulled from the sea after a wooden boat capsized last Friday. The rescuer, who works for the German rescue organization Sea-Watch and gave his name to Reuters only as Mark, is a father of three. A helmet obscures his eyes, but he appears to be looking at the child with profound sorrow. "I began to sing to comfort myself and to give some kind of expression to this incomprehensible, heart-rending moment. Just six hours ago this child was alive," he told Reuters about finding the child in the water with his or her arms outstretched. The office of the United Nations High Commissioner for Refugees, also known as the UNITED NATION Refugee Agency, noted in a news release that 2016 has proven to be uniquely deadly for the perilous voyages of migrants from war-torn communities of the Middle East, who travel to the shores of Italy and Greece from across the Mediterranean Sea. "Some 2,510 lives have been lost so far compared to 1,855 in the same period in 2015 and 57 in the first five months of 2014. On a Mediterranean-wide basis, the odds of being among the dead are currently one in 81. 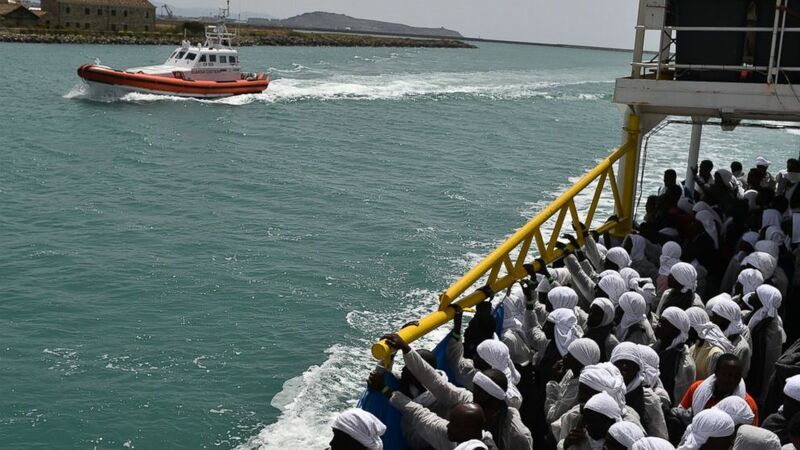 This highlights the importance of rescue operations as part of the response to the movement of refugees and migrants in the Mediterranean, and the need for real, safer alternatives for people needing international protection,” the agency said. The image of the drowned infant stirred immediate recollections of Alan Kurdi, a drowned toddler, who became a symbol of the pain felt by refugees in September of 2015. The image of the little boy, lying dead on a beach in Greece, prompted an outcry on social media and helped underscore the gravity of the crisis to people around the world. 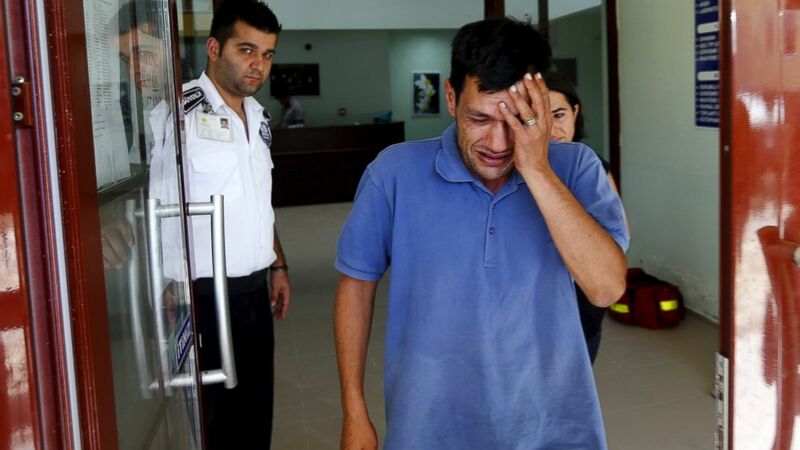 (Murad Sezer/Reuters) Abdullah Kurdi, father of three-year old Alan Kurdi, cries as he leaves a morgue in Mugla, Turkey, Sept. 3, 2015. Philosophers, like the Australian ethicist Peter Singer, have struggled to analyze why the story of a single victim is more effective in galvanizing empathy for victims of a widespread cultural phenomenon than a story about an entire group, but Sea-Watch hopes that the emotional power of the image will draw greater global attention to the ongoing suffering of refugees. "We didn't plan to take the photo. It was an accident," Ruby Hartbrich of Sea-Watch told ABC News. "We debated whether or not to release it, but decided that maybe it could be a symbol of what is happening in the Mediterranean. "We hope that many other children will not suffer this same fate," she added. Hartbrich is a 26-year-old medical student from Muenster, Germany, who, like her colleagues at Sea-Watch, works as a volunteer. She said that the group is a young nongovernmental organization, founded roughly a year and a half ago, and has helped to rescue thousands of migrants struggling to reach Europe. She said she was inspired to join the group because of pictures she had seen from the crisis, like the one shared by the group Monday, and that members of the group receive a psychological briefing and debriefing before every mission to help them prepare for the horror of what they will see in the Mediterranean while working. (AFP/Getty Images) Migrants arrive in the port of Cagliari, Sardinia, aboard rescue ship "Aquarius", on May 26, 2016, two days after being rescued near the Libyan coasts. Hartbrich told ABC News that she has seen "mass graves of bodies" floating in the Mediterranean Sea, and that she wants the European Union to provide safe passage for refugees to European shores in order to help mitigate a crisis that has exploded as a result of the violence and poverty experienced in countries like Syria, Yemen and Iraq. "We don't see an end to the current situation," she said.